Whether you’re a professional contractor or a new homeowner, many jobs and projects require reliable, sturdy air tools and equipment. This also means that there are many different accessories that you may need for any given project. Yes, you could simply purchase these accessory parts on an individual, as-needed basis, but why do that when it could potentially cost you more money in the long run? 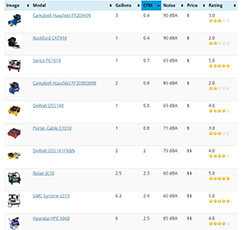 Purchasing accessory kits is one of the easiest and cheapest options that any customer can consider. 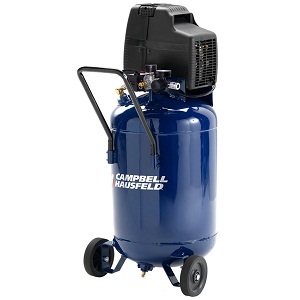 The Campbell Hausfeld company offers one of the largest air tool accessory kits on the market. Let’s see how the Campbell Hausfeld MP5200 25-piece accessory kit with case stacks up against its competitors. 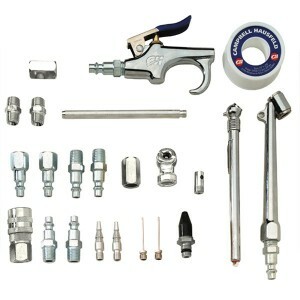 The Campbell Hausfeld MP5200 accessory kit is specifically designed for start-up contractors and new air tool owners. It comes complete with just about every major accessory tool you would need in order to complete large and small projects around the house or job site. The package includes a tire chuck, duel tire chuck, tapered nozzle, blow gun, adapter, extension nozzle, safety nozzle, rubber tip, eight plugs, a coupler, and an inflation needle for blowing up balls and tires. Additionally, this set also includes a tire gauge, Teflon tape, two ¼-inch male couplers, two ¼-inch female couplers, and a sturdy carrying case to keep all of these tools neatly organized while travelling.The blow gun can be used for a wide variety of purposes, including blowing away dust, dirt, and debris from your workstation to improve visibility and reduce safety hazards. It can also be used to quickly and easily dry wet surfaces. 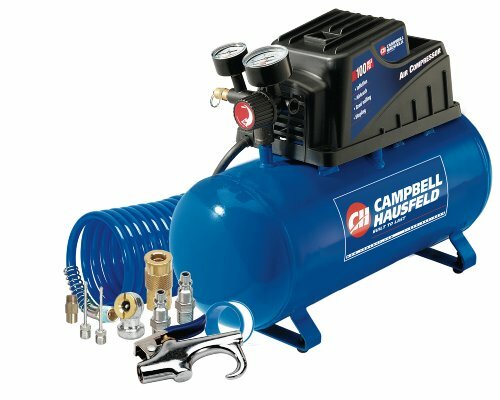 The Campbell Hausfeld MP5200 accessory kit is specifically designed for start-up contractors, casual users, and new air tool owners. The wide variety of accessories included in this kit, coupled with the handy carrying case makes this set perfect for professional contractors, do-it-yourselfers, as well as sports coaches. All-In-One Starter Set includes virtually everything you’ll need to begin a wide range of projects. Backed with a 1-year Limited Warranty. 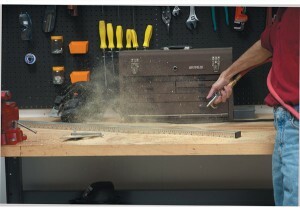 Includes carrying case for easily transporting tools from workstation to workstation. No parts are made of brass. Manufacturer has discontinued this product. Overall, the impressive number of accessory parts you receive with this kit, plus the carrying case makes this product a great choice for beginners looking to build a collection of air tool parts. Most of the parts are made of steel, which may eventually rust. Keep this in mind when making purchasing decisions. If you live in a climate that sees a lot of freezing and thawing months, this may not be the best option for you. However, if you live in a warmer climate, this just may do the trick. Additionally, although the company has discontinued this product, it is still covered under a 1-year limited warranty. While you may find that replacing specific parts may be somewhat difficult, Campbell Hausfeld’s warranty and customer service representatives are some of the best in the industry. All in all, with the affordable price, 1-year limited warranty, and all the pieces included in this set, these features are what makes it a difficult product to pass up.